This night is exclusively for our newest members who have just started Socialising with us. We’ve reserved our own room in a Covent Garden Bar. It’s all about taking the plunge this week at our New Members Social. 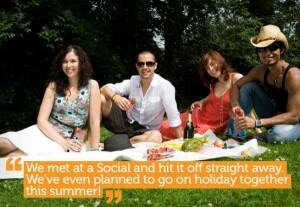 You’ve got to start somewhere on CitySocialising, and the best place is right here! And this week our New Member’s night is a fabulous bar located within the heart of the West End, a short walk from Covent Garden or Leicester Square tube stations. This bar is a great location for meeting some new London CitySocialisers this evening. Two of our CitySocialising Hosts will be on hand during the evening to welcome you when you arrive, settle you in to the night and answer any questions you might have about the site and service but really it’s just a great opportunity to go for it and start getting social with us. The evening will most certainly help to assure you that the people we attract are as laid-back, chatty, friendly and sociable as we say they are. The perfect opportunity to kick-start your social life and meet a whole new social circle, we look forward to seeing you there.